Iryna Khadarenka was born in 1976 in Minsk. She finished a musical school and studied economy and management at the Belarusian State Economic University. After that she finished postgraduate school at the Belarusian State University of Culture and Arts and got PhD in cultural studies. Additional education: Warsaw and Jagiellonian Universities (fellowships for young scholars), Council of Europe's East European School of Political Studies. She works as associate professor at the University, researcher and art-manager. Khadarenka writes poetry and prose, translates from English, Polish and Russian. 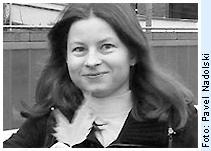 She took part in various literary festivals, both domestically and abroad, and she is a member of the Belarusian Writers’ Union and the Belarusian PEN Centre.